With Summer all but gone, there’s not much time left to grill outdoors. Thankfully, just in time for Fall and Winter to set in, T-Fal has introduced this little kitchen godsend – the OptiGrill – not to be confused with the OptiGrab in Steve Martin’s The Jerk. 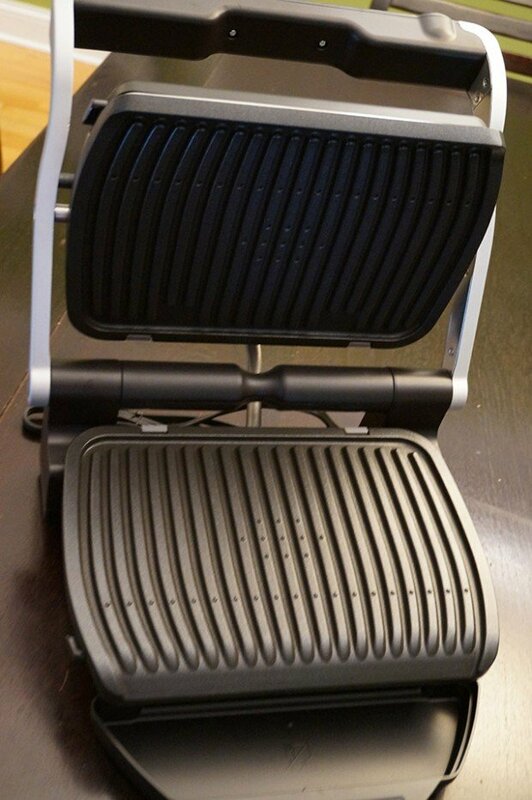 Though unlike Navin R. Johnson’s silly invention, the OptiGrill is a really great idea. This handsome stainless steel kitchen appliance distinguishes itself from other tabletop electric grills by its groundbreaking technology – which tells you when your food is cooked just right. 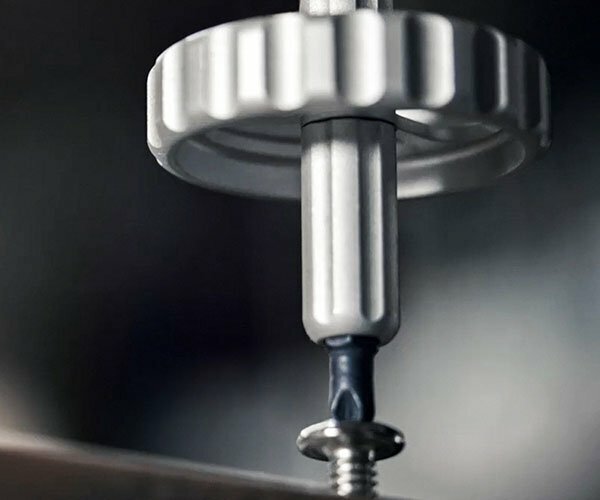 This sensor can indicate the temperature of meats you’re grilling, as well as when the grill is at optimum temperature to start cooking your food. 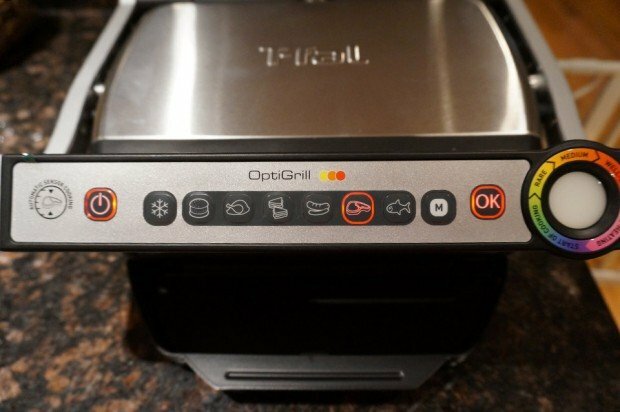 Setting up the OptiGrill is super easy. Just take it out of the box, remove the packing materials, and “bless” its surface with a little oil (I used some PAM spray) before cooking to give the non-stick surface an added boost, and to impart some extra flavor into your grilled foods. 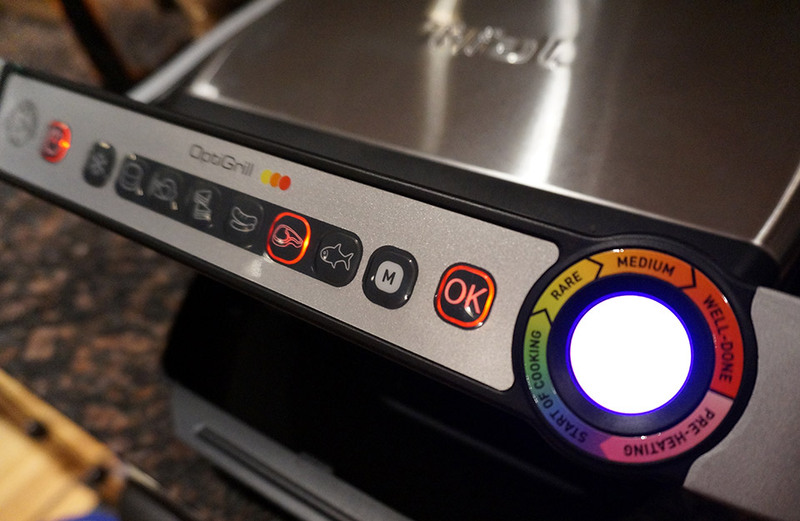 Once plugged in, simply press the Power button, select the type of food you’re cooking, and “OK”. 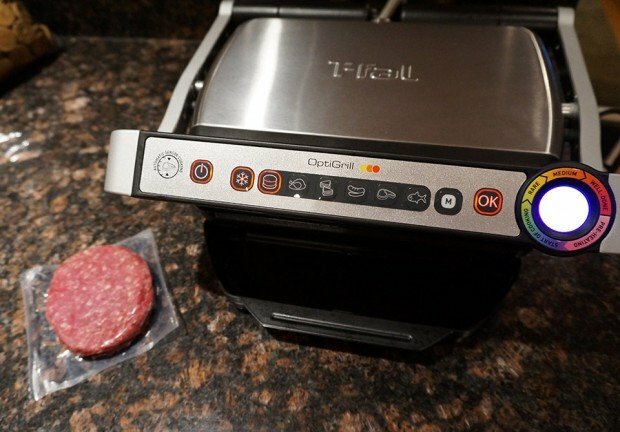 If you’re dealing with meat that needs defrosting, press the snowflake button first. You can choose from six different types of food programs to cook: burgers, poultry, sandwiches, sausage/pork, red meat and fish. 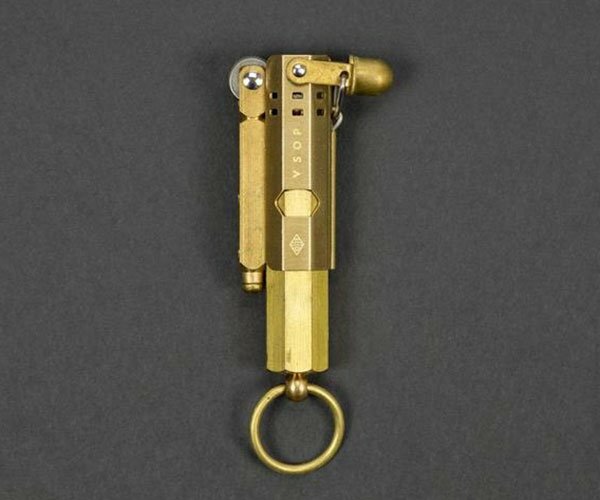 You can even start off with foods that need defrosting, or set a manual mode where you can cook items as long as you want. The grill is even smart enough to measure the thickness of foods to take that into account when cooking. 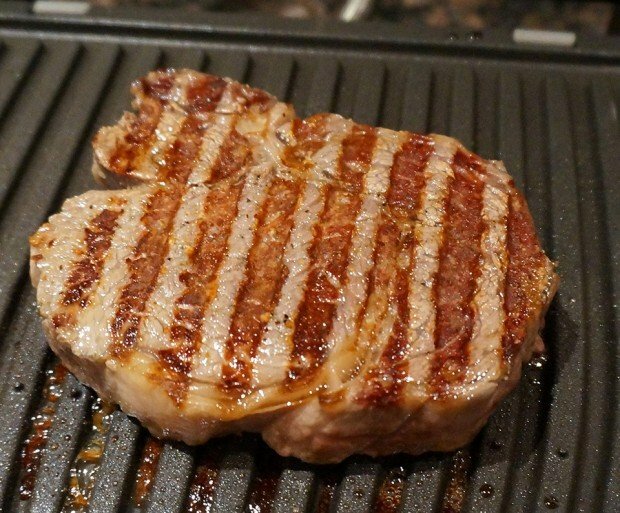 Keep in mind that T-Fal doesn’t recommend cooking meat that’s more than 1.5 inches-thick, nor meat with bones which can cause uneven heating. 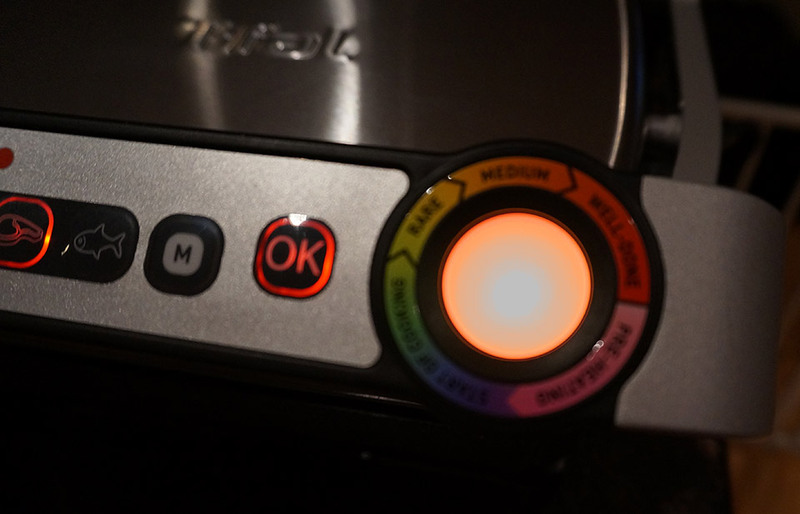 As it heats up, a colorful LED light show begins – starting with a blinking magenta to indicate pre-heating, then a solid magenta accompanied by a beep when it’s ready to cook – a process that takes about five minutes. 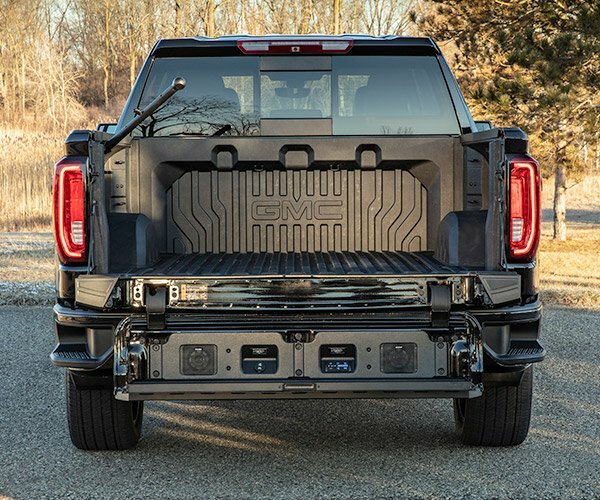 Just place your meat or panini on the grill, close it and watch the light show. 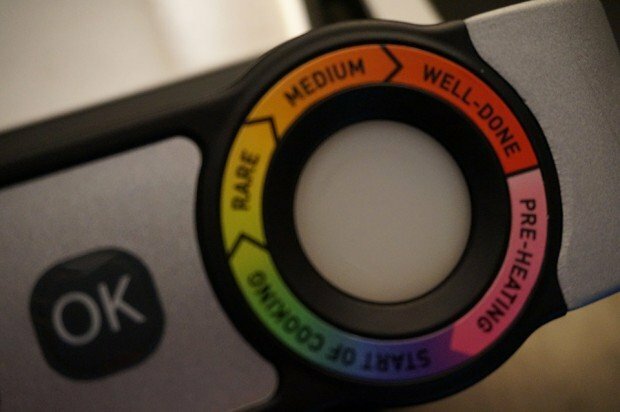 The light starts off green to indicate that cooking has started, and gradually goes through a range of yellow, orange and red shades to indicate level of doneness. 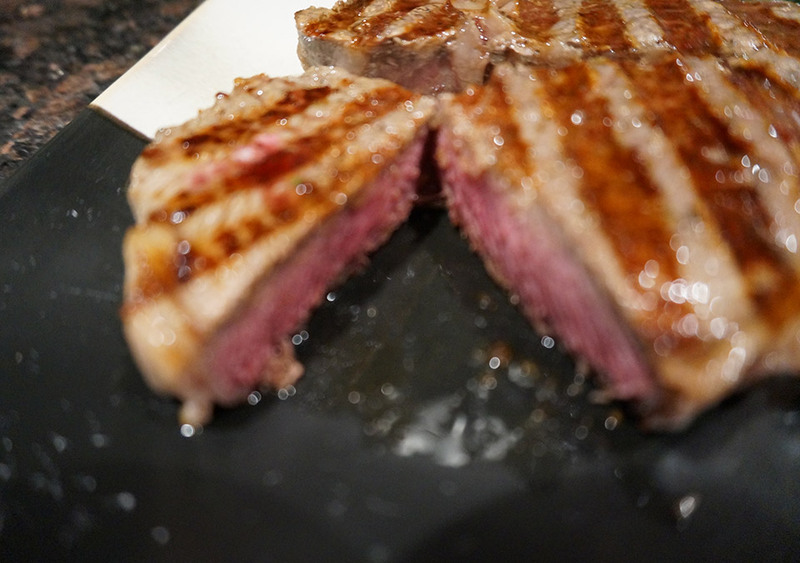 In my case, I started with a inch-thick, 10-ounce ribeye steak on the grill. In a matter of about five minutes, the light reached the shade of orange that indicated medium rare. And if you can’t tell one color from another, it beeps when it achieves Rare, Medium and Well Done levels. My steak turned out just right, along with those perfect sear lines you want when grilling foods. Given the fact that I just went to a fancy restaurant with a professional chef last week and had to send my steak back because it wasn’t cooked properly, I’m impressed. 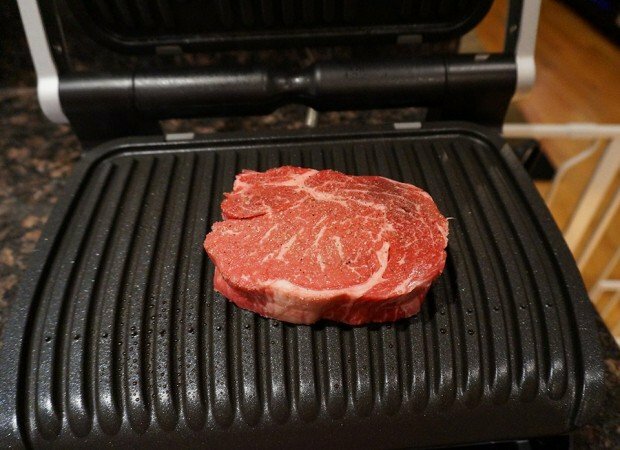 As an added bonus, I found that the amount of smoke that the OptiGrill produced from cooking was significantly less than that I get when cooking steaks on the countertop in a pan. Never mind that the grilled meats are healthier than those soaking in their grease in a pan. 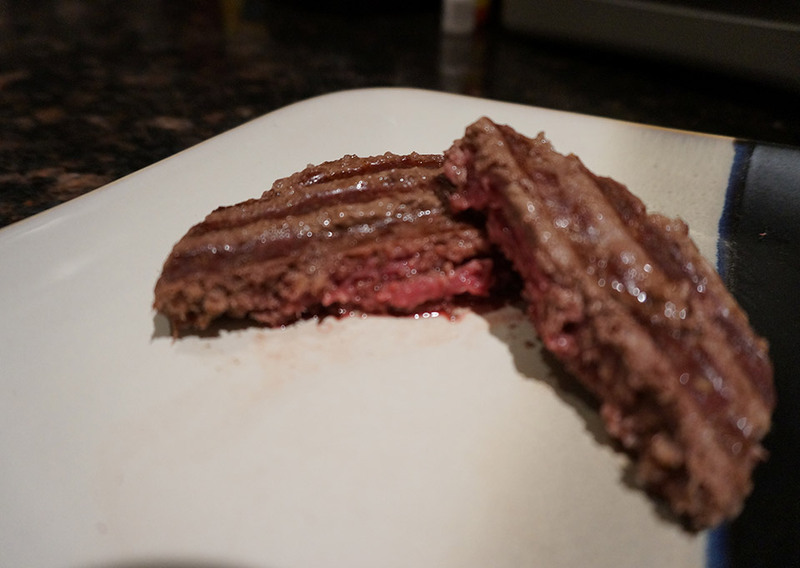 I also put the defrost mode through its paces, and it turn a hockey puck of ground bison into a perfectly cooked burger in about 12 minutes from plug-in to chow-time. 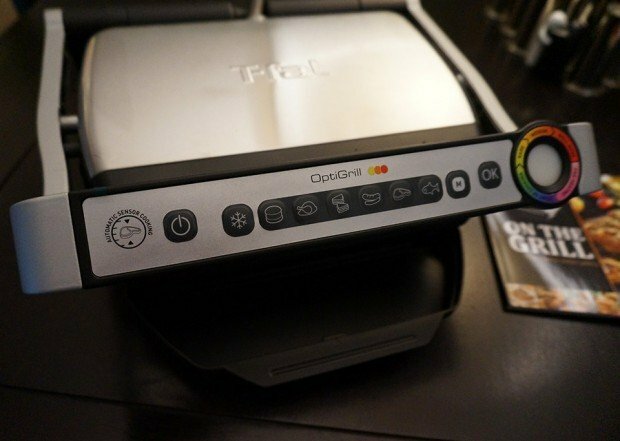 When you’re done cooking with the OptiGrill, all you need to do is turn it off, unplug it, and wait an hour (or more). 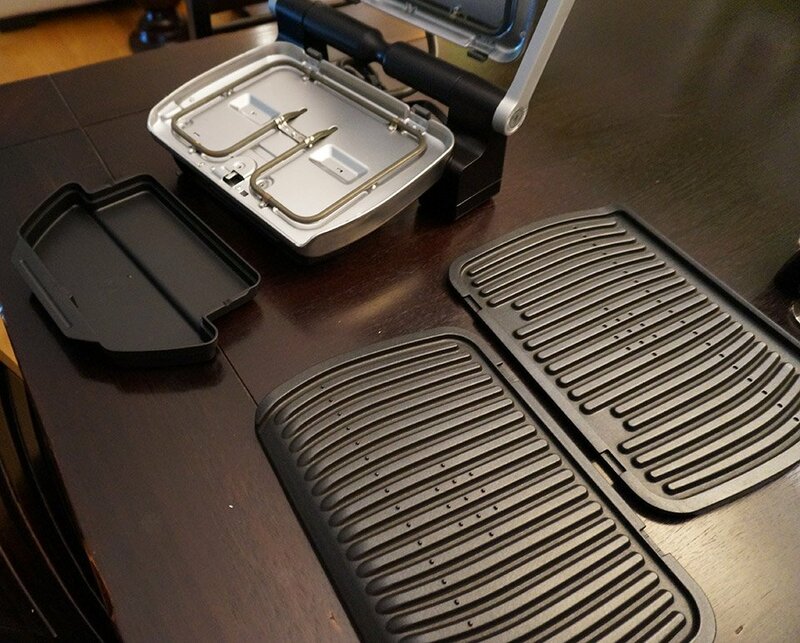 Once it’s cool to the touch, you snap off the non-stick grill plates and slide out the drip tray and wash them. One note – the drip tray isn’t dishwasher safe, so you need to hand wash it. 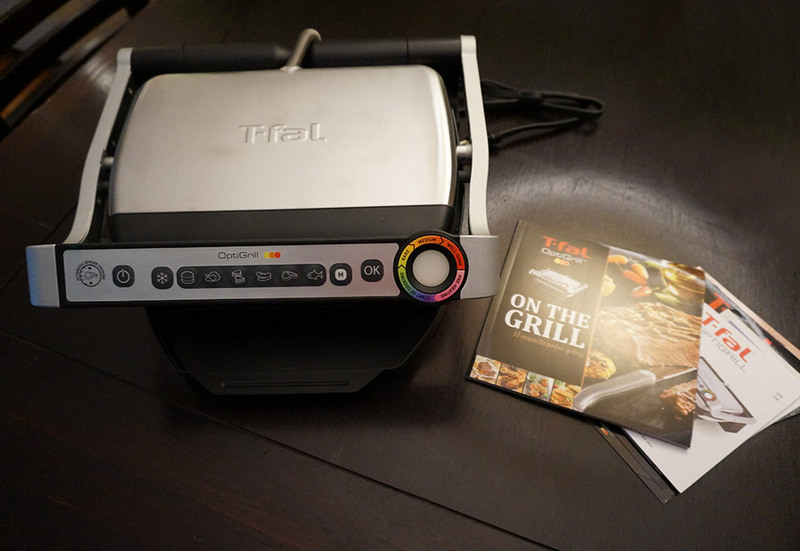 I’m very impressed with the T-Fal OptiGrill. It’s a must-have appliance for kitchens if you like grilled foods and either don’t have space for an outdoor grill, or don’t want to deal with the hassle of starting up and cleaning your grill. Also, I can speak from experience that it’s no fun to fire up my outdoor grill in the middle of winter in Chicago. The T-Fal OptiGrill ships this October, and will be available from Bed Bath and Beyond stores for $179.99(USD). It includes everything you see here, including a 72-page book with 32 recipes, offering everything from buttermilk-rosemary chicken thighs to BBQ ribs and herb-roasted potatoes.